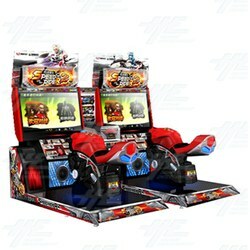 Speed Rider 2 is an arcade motorcycle-racing simulator machine from IGS. This exciting racing game allows for solo or multiplayer gameplay, as well cooperative and versus play. It has a number of features that make this game fun for players and encourages customer return. Features include: -THE CARD SYSTEM - The card system for speed racer allows players to save games, keep track of high scores, organize a team, us the customization studio, increase bike performance, possibly win IR passwords and allows access to the online ranking registration. The card can be used up to 200 times, after which it will need to be replaced. To activate the card, first, insert the card. Second, choose a gender and character. Some of your old favourites are back, including Mia, Willy, Cheng, Lilith, Tyrant, Shawn, Lily and Aura. There are also new characters to choose from as well including Randal, Rock, Leona, Lee, Johnson Jr. and a mystery character hell bent on destroying the Speed Rider Competition. Third, choose your bike. There are four models to choose from - MoonDance (Handle Type), Inferno (Acceleration Type), Unicorn (Average Type - good for entrance level players) and Thunderbolt (Speed Type). Fourth, choose a color for your bike. Fifth, enter your name with a maximum of ten English letters/digits. Sixth, enter your license number with a maximum of five English letters/digits. Your card should now be activated once you confirm these details. -THE Team SYSTEM - The fleet system allows you to create a team. You will need to check you are eligible for the fleet feature first before you can activate it. Once active, insert coins and press the 'Up', 'Down', 'Left' and 'Right' buttons, and the 'Brake', to create a team. Players who want to join your team will have to insert coins with teammates, then press and hold the 'Down' button for three seconds. After this, select a symbol for your team and enter your team name with a maximum of ten English letters/digits. Confirm these details and this will complete the team feature, and you will see your team symbol on the chart, in the game and on the bike profile. PLEASE NOTE: This feature is only available for players using the SR card. Each card allows one opportunity to organize and join a team. Players of a team can invite players to a team to join if they do not already belong to a team. -BOOST BUTTON - this is a big button players can hit to give your bike a boost of speed when needed. -BENDING SENSOR DEVICE - when you bend your upper body to block the IR sensor, it will reduce wind resistance and your bike will run faster, although faster may make corners harder to handle. -ROLE DRESSING SYSTEM - this features is for character customization. It includes outfits, racing gear, helmets and fun accessories. -CUSTOMIZATION SYSTEM - this feature is for bike customization. It includes the body, paint design, exhaust pipes and N2O color. -FOUR TRACK LOCATIONS(IN FORWARD AND REVERSE) - these track locations include Mt. White, Shanghai (Pudong, The Bund, Nanpu), Beijing (Beijing, the Forbidden City, Summer Palace) and Hong Kong (Kowloon, HK Island, Nathan, Victoria). -THREE MODES OF PLAY - the game includes three modes of play titled Survial, Story, and Time Attack. -5 CHAPTERS, 26 STAGES - the game includes five chapters and 26 stages. Chapter 1. Incognito has four stages; Chapter 2. A-Team has six stages; Chapter 3. Dark Horse has six stages; Chapter 4. Reunion has six stages; and Chapter 5. Final Duel has four stages. THE CARD SYSTEM - The card system for speed racer allows players to save games, keep track of high scores, organize a team, us the customization studio, increase bike performance, possibly win IR passwords and allows access to the online ranking registration. The card can be used up to 200 times, after which it will need to be replaced. To activate the card, first, insert the card. Second, choose a gender and character. Some of your old favourites are back, including Mia, Willy, Cheng, Lilith, Tyrant, Shawn, Lily and Aura. There are also new characters to choose from as well including Randal, Rock, Leona, Lee, Johnson Jr. and a mystery character hell bent on destroying the Speed Rider Competition. Third, choose your bike. There are four models to choose from - MoonDance (Handle Type), Inferno (Acceleration Type), Unicorn (Average Type - good for entrance level players) and Thunderbolt (Speed Type). Fourth, choose a color for your bike. Fifth, enter your name with a maximum of ten English letters/digits. Sixth, enter your license number with a maximum of five English letters/digits. Your card should now be activated once you confirm these details. THE Team SYSTEM - The fleet system allows you to create a team. You will need to check you are eligible for the fleet feature first before you can activate it. Once active, insert coins and press the 'Up', 'Down', 'Left' and 'Right' buttons, and the 'Brake', to create a team. Players who want to join your team will have to insert coins with teammates, then press and hold the 'Down' button for three seconds. After this, select a symbol for your team and enter your team name with a maximum of ten English letters/digits. Confirm these details and this will complete the team feature, and you will see your team symbol on the chart, in the game and on the bike profile. PLEASE NOTE: This feature is only available for players using the SR card. Each card allows one opportunity to organize and join a team. Players of a team can invite players to a team to join if they do not already belong to a team. BOOST BUTTON - this is a big button players can hit to give your bike a boost of speed when needed. BENDING SENSOR DEVICE - when you bend your upper body to block the IR sensor, it will reduce wind resistance and your bike will run faster, although faster may make corners harder to handle. ROLE DRESSING SYSTEM - this features is for character customization. It includes outfits, racing gear, helmets and fun accessories. CUSTOMIZATION SYSTEM - this feature is for bike customization. It includes the body, paint design, exhaust pipes and N2O color. FOUR TRACK LOCATIONS(IN FORWARD AND REVERSE) - these track locations include Mt. White, Shanghai (Pudong, The Bund, Nanpu), Beijing (Beijing, the Forbidden City, Summer Palace) and Hong Kong (Kowloon, HK Island, Nathan, Victoria). THREE MODES OF PLAY - the game includes three modes of play titled Survial, Story, and Time Attack. 5 CHAPTERS, 26 STAGES - the game includes five chapters and 26 stages. Chapter 1. Incognito has four stages; Chapter 2. A-Team has six stages; Chapter 3. Dark Horse has six stages; Chapter 4. Reunion has six stages; and Chapter 5. Final Duel has four stages. This is a Highway Entertainment video. Footage of the Speed Rider 2 from the GTI Asia Taipei Expo 2013. This is a trailer from IGS for the motorcycle-racing, simulator, arcade machine - Speed Racer.